Choose a date and time for the login filter by either typing it in or selecting it via the calendar icon . Filter by duplicate email addresses: Tick this checkbox if you only want to display users whose email address is in the system twice so you can deal with them more easily. Search: Type the name, display name, username or email address or any partial thereof you wish to search for in the search field. If you turned on the exact search, you need to provide the correct name or email address and not a partial one. Institution: Choose the institution from the drop-down menu in which you wish to search for the user. Results per page: Decide how many results per page you want to view. Institution: You cannot click on the heading and change the sort order. If you want to filter for a specific institution, use the institution filter above. Selected users: Review the users you have selected for performing bulk actions. Reason for suspension: Provide a reason for suspending the users listed on this page. 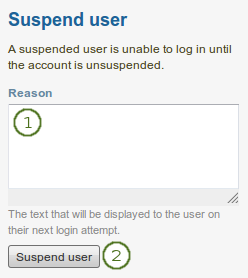 You need to click the Suspend button in order to suspend the users. Change authentication method: Choose a new authentication method from the drop-down menu for the users listed on this page. 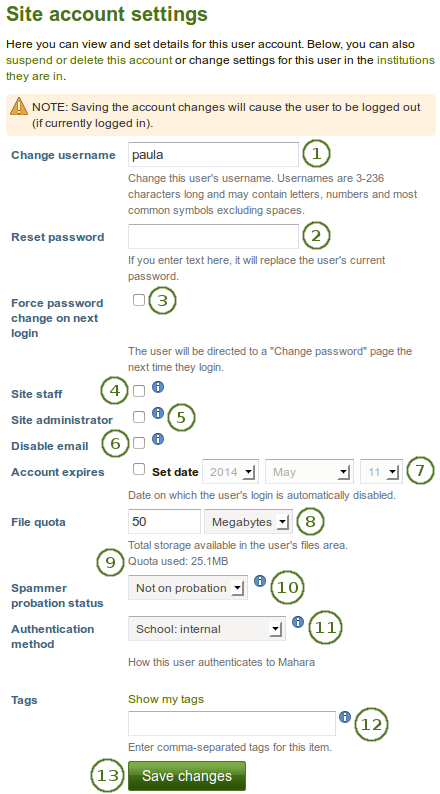 Set spam probation: Choose the number of points a user shall get to be “on probation” from the drop-down menu. Click the Submit button to change the number of probation points. $cfg->probationenabled = true;: This setting decides that users can get a probation status. $cfg->probationstartingpoints = 2;: This setting determines how many probation points a newly self-registered user has per default. Click the Delete button to delete accounts and all of their content of the users listed on this page. Export users in CSV format: Click the Download link to download the information that you see on this page as CSV file. Choose the Access list tab. 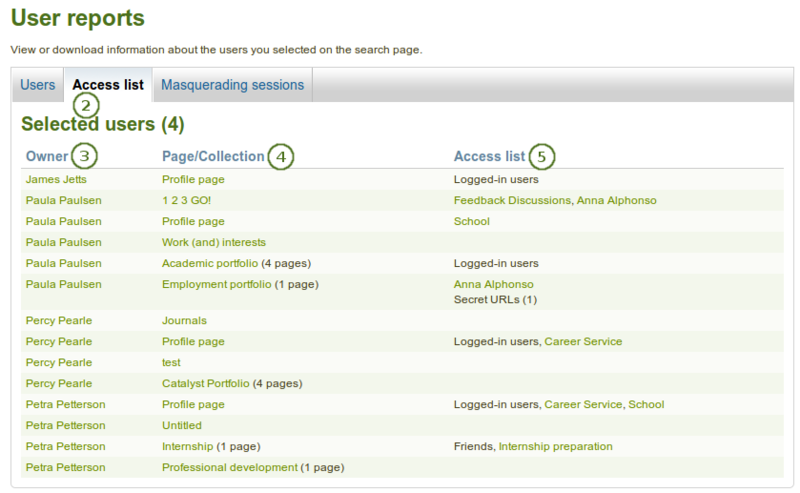 Choose the Masquerading sessions tab. Click on the user’s name to go to this user’s profile page. You can then click the Log in as … link to become that user. Click the Log in as button to become that user. You see a red bar at the top of the browser window telling you that you are masquerading as that user. The name of the administrator who logged in as you is linked to the profile page for you to easily contact that administrator. Disable email: Check this box to disable the sending of emails for this user. If email is disabled, notifications and messages can only be viewed in the internal inbox. You can set up your Mahara site so that emails are disabled automatically if they are bounced back. Account expires: Tick the checkbox if you want to specify an account expiration date. Once done, the date picker is activated for you to enter a date. Choose the date on which the user’s login will be disabled automatically. The default setting is that the date is not specified. You always see the current date in the greyed out date fields. 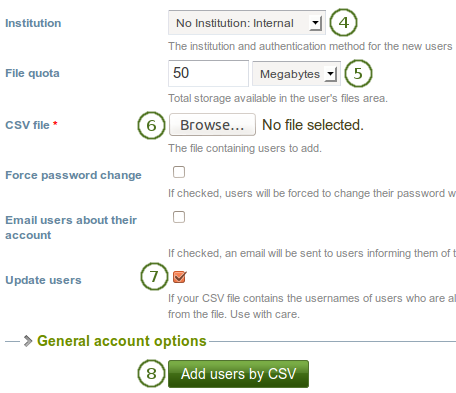 You can set an automatic account expiry date for all users in the account settings of the site configuration. Spammer probation status: This setting controls whether the user is considered to be on probation as a possible spammer. Membership expires: Tick the checkbox if you want to specify the date when the user will be removed from this institution automatically. Once done, the date picker is activated for you to enter a date. Choose the date on which the user’s login will be disabled automatically. The default setting is that the date is not specified. You always see the current date in the greyed out date fields. 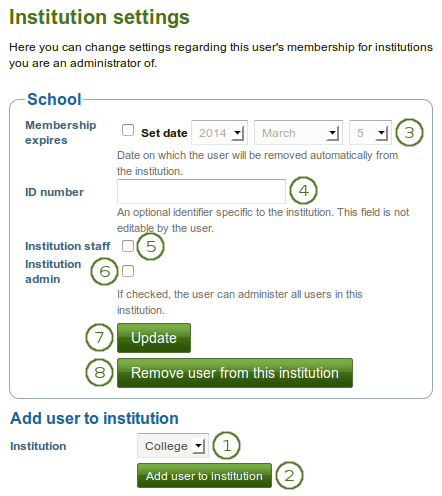 You can set an automatic institution membership expiry date for all users in your institution in the settings for your institution. Institution staff: Check this box if you want to give this user staff rights in this institution. This will allow them to create controlled groups for example. 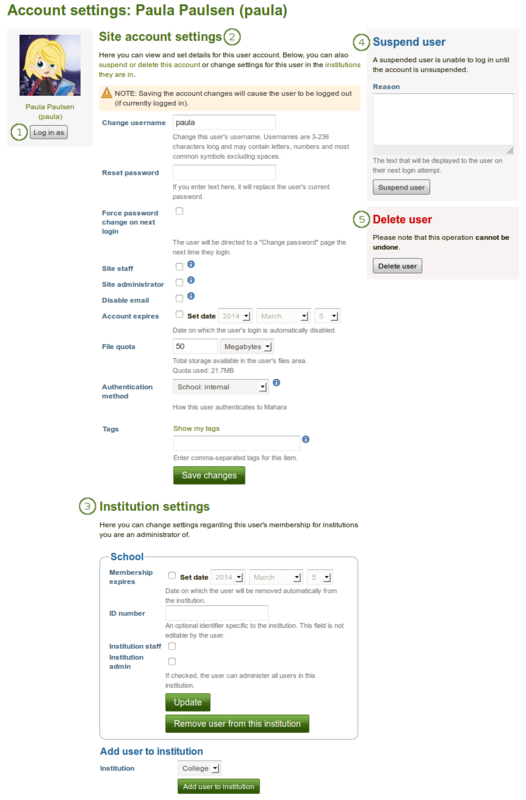 Institution admin: Check this box if you want to make this user an administrator of this institution. This will allow them to manage all users in this institution for example. Search: If you have too many users on your site and you cannot see / find the users you want, you can search for them here. Add the potential staff members to the right-hand side - Current staff - by clicking the right-arrow button . Then click the left-arrow button , and the user is removed from the list. Add the potential site admin to the right-hand side - Current administrators - by clicking the right-arrow button . Site staff: Check this box if the new user should have site staff rights. Only site administrators see this option. Site administrator: Check this box if the new user should have site administrator rights. Only site administrators see this option. If you want to update existing users, you do not need to set a password. You can mix new and existing accounts in your CSV file. When you add a new user, the password field must be present. 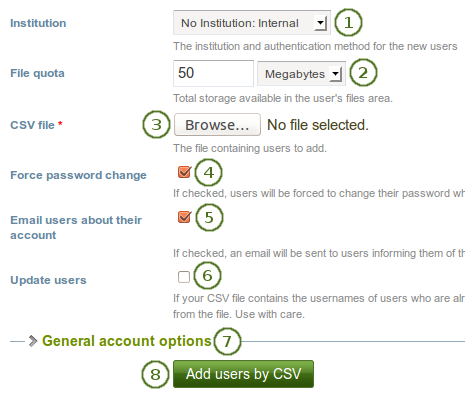 If you do not wish the password to be changed for existing accounts, leave that field empty for the existing accounts. Your file must also include fields that are mandatory for all users to fill out and any fields locked for the institution you are uploading the users for. All other fields are optional. This is the full list of additional fields that you can add in your CSV file upload. Export users in CSV format: Click the Download link so that you get a CSV file which contains all necessary information for you to change the users’ remote username in bulk. This is necessary if their internal Mahara username is not the same as the one they use to authenticate on your system that is linked to Mahara or if they already have a remote username that would be incorrect for your institution. You must provide a password for this new user. All other users do not need to have a value in the password field. If you only want to update existing users, you can leave the password field entirely off.